The definition of a "cute 'em up"
We've reached the start of a new month again, which means Nintendo of Japan has once again revealed its upcoming plans for the Wii Virtual Console. There are just three new games this August, with the Neo Geo still enjoying a good bit of a resurgence. All three games are pretty good, though there's no particular surprises this time. Takahashi Meijin no Daibouken Jima II — Although Master Takahashi/Higgins can really only be considered a legend in Japan, Europe has once again beaten the land of the rising sun to the punch, as this game's western equivalent, Super Adventure Island II, has been available in Europe for a while now. Ryūko no Ken Gaiden — The third game in the Art of Fighting series, called Art of Fighting 3: The Path of the Warrior in the West. If the Neo Geo starts getting games in the West again, this should be a surefire release. Twinkle Star Sprites — A bizarre mix of a shoot 'em up and a puzzle game, where the objective is to both attack the enemies on your side of the screen as well as sending damage your opponent's way. Although relatively well known in the West, the game was never actually released outside Japan; perhaps another Neo Geo import candidate? Again, Nintendo of Japan has not announced a whole month's worth of 3DS Virtual Console games in advance, but next week, Japanese 3DS owners can expect Alleyway and Nekketsu Koukou Dodge Ball-Bu, which is basically a Game Boy version of Super Dodge Ball. Not many games, but the selection is quite good. Would you get any of these? I really hope Art of Fighting 3 gets a western release. Its by far the best game in that series. Where Adventure Island 2 for the Nes!? I will not be surprised (but mad though) when SNKP decides to keep TSS in Japan as usual just like they did to the Neo Geo, PSX, Saturn, Dreamcast, & PS2 version. Going by recent American releases catching up to European releases, you'll get it sooner or later. Adventure Island II, Super Adventure Island 2 and The Ignition Factor — its pretty safe to say that these games will come out on the August 11, August 25 and September 8. AOF3 is a really interesting title since it tried to mix 3D juggle gameplay with a 2D fighter. Twinkle Star Sprites sounds interesting. If they decide to bring it over i may get it. Japan had more games released for these systems in the first place, therefore they have a larger pool to choose from. We need more Neo Geo games on Wii VC. Last Blade please. 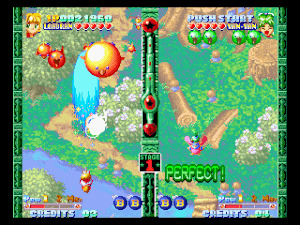 Twinkle Star Sprites kinda reminds me of Twinbee... I wish they'd release more Twinbee games over here. All we have is the inferior TG-16 port of Detana!! Twinbee. Good to see Japan getting more good games. Art of Fighting 3 is a unique best, I have it on the PS2 with Art of Fighting Anthology. Art of Fighting 3 is the only one I'll get if it ever comes to NA VC. I want Adventure Island II for the NES badly as well. I've been enjoying Super Adventure Island and New Adventure Island a lot lately, but Adventure Island II is the only one I really played as kid.